My son received the 80 piece set for a Christmas gift from my Husbands parents. My side of the family is very aware of, and totally respectful of my wishes regarding made in the USA & (mostly) wooden play things for my family. I immediately assumed the Mega Bloks were going to be made in China, but was surprised to see they were made in Canada. OK, not terrible I thought, Canada has decent standards from what I know. My son dumped them out & within minutes of receiving the gift, Mega Bloks was suddenly part of his vocabulary, and Mega Bloks were suddenly all over our house. I studied the bag for info on the Bloks. The bag boasts “PVC-free Eco-bag”. Cool. But, what about the blocks–the item my child will be playing with? So I wait for Christmas to get over & call their NA headquarters in Montreal, Canada. I get a recording that says to leave a message & they’ll call back, which I did. A week went by with no call back (I tried calling here & there only to receive the same “we’re busy, leave a message”). So I left my question on their FB page. Several days went by & they answered all messages around mine, but not mine, so I reposted it. Q: What type of plastic are your blocks made of? Are they PVC & BPA-free? 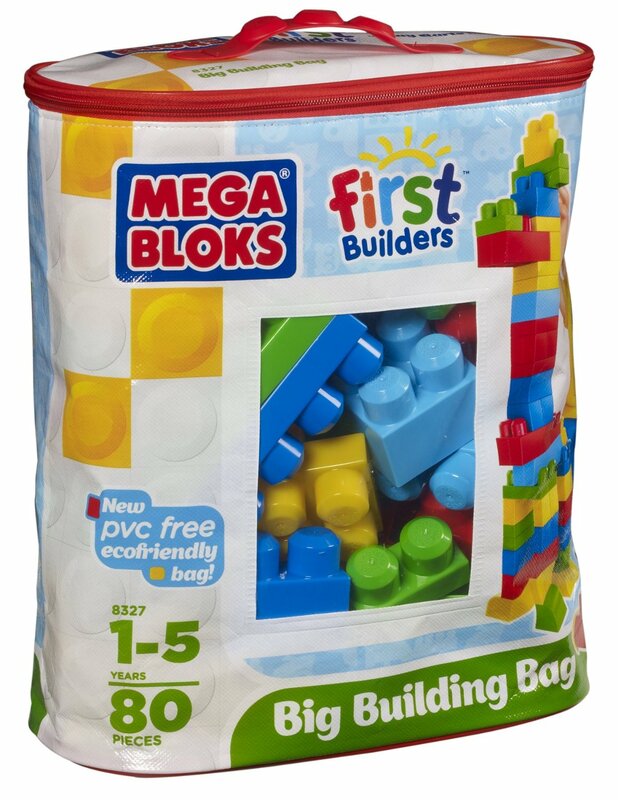 The bag advertises as PVC-free, but I find it odd that the info on the blocks is hard to come by, I see no info regarding it on your site, unless I’m missing it. A: All Mega Bloks products meet United States and Canada Toy safety requirements for BPA and PVC. We do everything we can to keep them safe for kids of all ages. A: Our toys adhere to US toy safety standards and we are proud to enforce higher internal safety thresholds than required by the standards, but we cannot confirm that the blocks do not include trace amounts of PVC. We assure you that our toys are safe for our families and yours. What ticks me off the most? That they “assure” they are safe, although they cannot even confirm what is, or isn’t in them. No words can convey my frustration with that! WHY would they advertise the bag as PVC-free, when the blocks themselves contain them? To gloss over that fact… To create a smoking mirror… This frustrates me to NO end. I know that in the post or 2 I’ve done about this to date, while trying to get to the bottom of it, many parents have expressed frustration- they fell for the “PVC-free bag”, and assumed the same of the blocks. I’ve learned it’s never safe to assume anything, but feel their marketing ploy on this one is very deceptive! While my son, who these were a gift for, is nearly 3 & not putting these in his mouth, his 6 month old Baby Sister is in the stage where EVERYTHING goes in her mouth. If it were not for her presence, I may just let my son keep these blocks, as he really, really was enjoying them. However, another issue that arose was I felt as soon as they were introduced to him the wooden block set he received a week prior from Smiling Tree Toys was a little less interesting to him, and that made me sad. And, I immediately loathed the mess they made around the house, as I was finding blocks everywhere. So, I packed them up one day during nap time & to my pleasant surprise he hasn’t asked about them once. We’re back to building towers & pyramids with his lovely, safe, handmade in MN wooden blocks, and I couldn’t be happier. I am going to send the Mega Bloks back to his Grandma & Grandpa’s, where they came from, and ask them to keep them there to play with while he’s visiting them. I will explain to them why I don’t want them in my house, which I’m happy to do as I know it’ll ensure we don’t receive any more Mega Bloks in the future! I REALLY, REALLY want to raise awareness on this issue, as I feel this company is “greenwashing” their products. I was surprised, after posting that we’d received these for a gift, how many replied that they’d received them too… So, please share this info on your page, and especially with other Mama/Dada groups you belong to. My mission to stick to wooden toys with safe finishes, organic cloth toys, or plastic toys from Green Toys (free of PVC, BPA, phthalates & lead) has been greatly reaffirmed! I’m looking forward to adding more wooden blocks to our collection from Smiling Tree Toys with the next Buying Club order in February. Do you think that getting rid of it entirely would help the communities go back to normal or would the damage be too great after all the time of it being made / incinerated? Stay tuned, they’re now claiming all their products are PVC-free. I will update as soon as I see some 3rd party verification on this. What a frustrating saga…. I can’t wait to resolve it completely, and will certainly let everyone know!! That is very deceiving. The fact they announce the bag is pvc free shows they know the dangers. Thanks for posting this info. I decided to research them before buying and I’m glad I did. Very enlightening to say the least! My only granddaughter is the light of my life and as a nurse I should have been more cautious when buying but was taken in by the bag statement. I felt it gave a blanket coverage for the blocks as well. Thank you for your research and for sharing the data with others.